Two major events will take place tomorrow – on Tuesday, January 4 – a meteor shower and a solar eclipse. Neither one is particular well placed for the Americas. The annual Quadrantid meteor shower is expected to produce its greatest number of meteors in the wee hours before dawn tomorrow. If predictions hold true, it should be best seen from western Asia and Eastern Europe. Then a partial eclipse of the sun takes stage during the daylight hours on Tuesday in Europe, northern Africa, the Middle East, and the western and central portions of Asia. For more about the eclipse, look here: Solar eclipse on January 4, but not in the Americas If you are in a place to see it, remember to use proper eye protection when watching this eclipse! Now about the meteor shower. The Quadrantid meteor shower is capable of matching the meteor rates of the better-known August Perseid and December Geminid showers. It has been known to produce up to 60 (or more) meteors per hour. This shower favors the far northern latitudes – for example, northern Europe, northern Asia, the northern U.S. and Canada. So why isn’t the Quadrantid shower as celebrated as the Perseid and Geminid showers? It is because the Quadrantid shower has a narrow peak that lasts for only an hour or two. If you miss the peak – which is easy to do – this otherwise tepid shower is sure to disappoint. In 2011, if the International Meteor Organization forecast holds true, western Asia and Eastern Europe should be in the best position to watch the Quadrantids in the wee hours before dawn Tuesday. Are you in the Americas and thinking of watching the Quadrantids? Go ahead. Meteor shower peaks are rarely certain, and sometimes a gamble on a shower will reward you with a good show. Just be aware you might not see any meteors! The Quadrantid shower is named after the defunct 19th century constellation Quadrans Muralis. If you trace the paths of the Quandrantids backward, they appear to radiate from a point where this constellation once reigned in the sky. This point is called the meteor shower radiant. 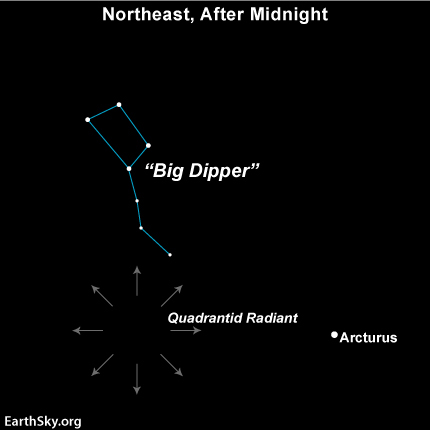 If you wish, you can locate the Quadrantid radiant in reference to the Big Dipper and the bright star Arcturus. 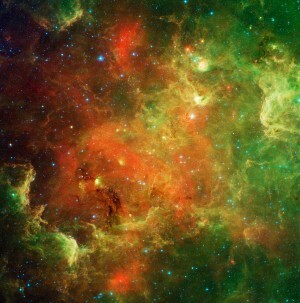 However, you do not have to find the radiant to enjoy the Quadrantids. You need a dark, open sky and to look in a general north-northeast direction for an hour or so before dawn. That is the Quadrantid meteor shower tonight for the world’s northerly latitudes and a partial solar eclipse tomorrow in Europe, northern Africa, the Middle East, and the western and central portions of Asia. Site contents copyright © 2019 Recorder Online	except as noted. All rights reserved. | 87 queries in 1.155 seconds.